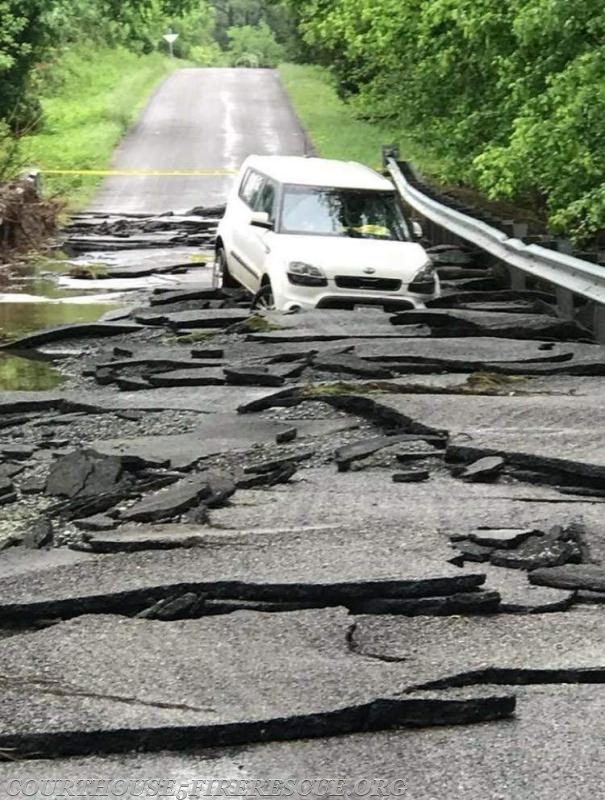 On Friday May 18, in the midst of the significant rainfall we received last week, Goochland Fire-Rescue was dispatched to assist two motorists who became stranded in a flooded portion of Riddles Bridge Road. Company 5 Firefighters Chris Jones and Tyler Wilkerson responded in Truck 5, along with numerous career and volunteer members, including the Goochland County Water Rescue Team. Truck 5’s ladder was fully extended to reach the vehicle and served as the means of escape for the stranded motorists. The photo shows the scene later in the day after the water had receded. This portion of Riddles Bridge will be closed for an undetermined length of time while repairs are made to the roadway.